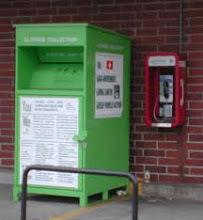 2006, Dec. 17, CBS5, Bay Area: Brilliant piece on Campus California and The Green Boxes for used clothes collection. Gaia representative admits that it is not a charity organisation. 2006, Dec. 3, Ekstra-Bladet: A Danish tourist has seen Amdi Petersen and Kirsten Larsen in Singapore. He notified the police, but nothing has come out of it. 2006, Nov. 24, DR: The planning of the trial is going on although the prosecution still hasn't been able to reach Amdi Petersen, Larsen, Gunst, Fuglsbjerg and Byrner. 2006, Oct. 29, Politiken: As reported by Tvindalert some months ago the TG has bought a huge estate on the mexican pacific coast just south of the US border, where they are building what is likely to be a new headquarter, designed by Jan Utzon. The Politiken reporter tried to visit the building site but was not allowed access. Several locals accuse Tvind of using illegal methods. Tvind's ownership to the land is disputed. My comment: A move to Mexico is not very unlikely considering the unstable situation in Zimbabwe, where the current HQ is situated - also designed by Jan Utzon by the way (not to be confused with Jørn Utzon, his father, who designed the Sidney Opera House). 2006, Oct. 23, Jyllands-Posten: Mogens Amdi Petersen, Kirsten Larsen, Marlene Gunst, Kirsten Fuglsbjerg and Sten Byrner are now wanted internationally - not to be arrested but simply to be able to announce to them in person that the verdict has been appealed by a representative of the public prosecutor, typically a policeman. This has not officially been confirmed by the prosecutor, Elsemette Cassøe. 2006, Oct. 2, DR2: In a remarkable interview on national television Simon Lichtenberg told about his role in the TG. He explained that his company, Trayton Group, is growing by appr. 20 % p.a. and an annual turnover of 'several hundred million DKr'. He stressed that the TG does not have a singular agenda or ideology. The TG is about individual projects with separate aims. His own appearance on TV, he said indirectly, was an example of how he has chosen a different approach to the general public than other members of the TG. My comment: SL now carries so much weight in the TG that this appearance can be interpreted as his suggestions for a new policy for Tvind and his - and perhaps others - wish to take over leadership in the organisation. 2006. Sept. 25, Ritzau: The police have now located Poul Jørgensen and handed him the subpeona. One down, five to go. 2006, Sept. 20, DR, The police are searching for Poul Jørgensen, Mogens Amdi Petersern, Kirsten Larsen, Christie Pipps, Steen Byrner and Marlene Gunst in order to announce in person that a new trial is beginning. Only problem is that they are nowhere to be found. The morning news on DR caught Poul Jørgensen on the phone and he promised that he would be at his office regularly. "The police should know where to find me. They have ransacked my place before." he joked. 2006, Sept. 13, several media: The prosecution has decided for an appeal. The case is being trimmed down to concern things done after 1989, thus excluding Bodil Ross Sørensen and Ruth Sejerø-Olsen from further trial. 2006, August 31, all media: Only Steen Byrner has been convicted. He was sentensed to 1 year suspended jail. Since his confession earlier he was the most probable scape goat. The other 7 walk free. The prosecutor has not yet decided to appeal or not. An abstract of the verdict in Danish is to be found on the court house website. The verdict itself with documentation consists of 4000 pages. 2006, July 6, Fyens Stiftstidende: The Tvind school for troubled youths ' Småskolen Carene Star' based in Skodborgskov, Rødding, south Jutland, is closing. The main acitivity of the school was sailing with an old sailing ship 'Carene Star'. In the summer the ship was leased out for shorter trips with tourists. The town of Faaborg on Funen now regrets that visitors will not be able to take trips with 'Carene Star' this summer. 2006, July 5, DR-online: By rule of the court The Tvind foundation Fælleseje is going to pay 6,1 mill Dkr the costs of a big examination of the three Tvind foundations, Fælleseje, Thomas Brocklebank and Estate. Today Fælleseje has taken over the activities of the two other foundations. Please note: this case is not the same as the big criminal case against the Tvind leadership. 2006 June 30, Jyllands-Posten: Tvindalert.com has won a case against Simon Lichtenberg who wanted the internet provider, TDC, to shut down the website because of its critical view of his affiliation with Tvind. Personal note: congratulations. 2006, june 29, several media: The last of a total of 170 days in court since December 2002 has been held in the case against the Tvind leadership. A verdict is expected on August 31st. 2006, June 23, Berlingske Tidende: Tvind's lawyers claim that authorities years ago were fully aware of the nature of the transactions of the foundation. Their lack of intervention suggests that nothing illegal was done. 2006, June 23, DR Online: OFID - OPEC Fund for International Development - presented on June 13th its first annaual 100.000$ award to HUMANA for its work for the underpriviledged. 2006, April 12, Jyllands-Posten, Final trial hearings and procedures are expected to be held in the first days of May. The judge and the two lay-men judges will probably reach a verdict in August. The written conclusion of the court will include about 4000 pages of documentation. 2006, April 3, De bergske blade: The foundation at trial (see June 27th 2001) now without its Tvind board is still collecting money from former members of the Teachers Group, who obviously complain that the new board are continuing what they were supposed to stop. 2006, February 8, Frederiksborg Amtsavis: The Tvind property owner "Faelleseje" wants to sell one of its schools in Denmark, Asserbohus, to a property developer. The school is worth more than 25 mill DKr. The building has been empty since august 2005.